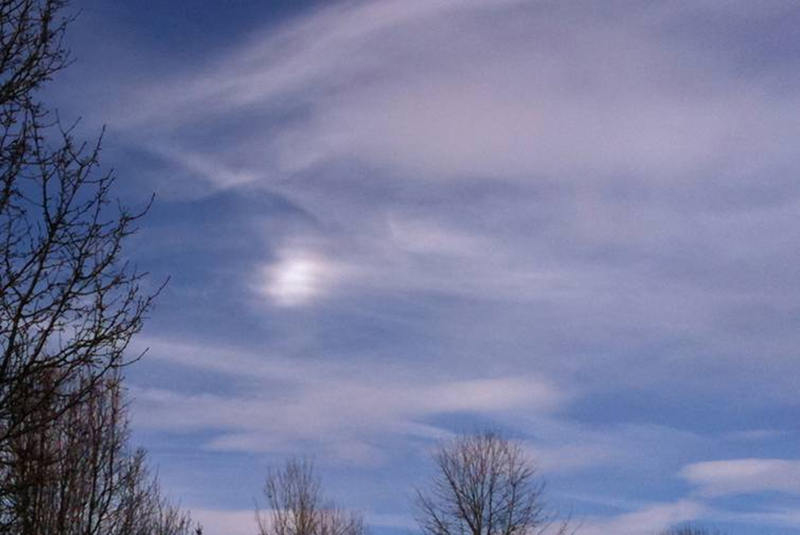 The 120-degree parhelion shown above is a bright, bluish spot positioned 120 degrees from the Sun. This one was high overhead a little before local noon in Easton, Pennsylvania on March 10, 2012. 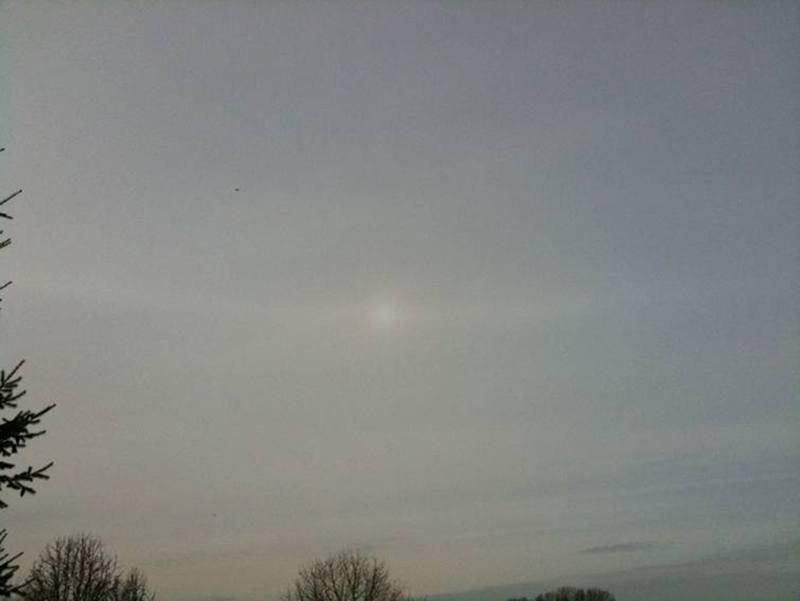 They can be found on the parhelic circle, which circles the sky at the same solar altitude as the Sun. 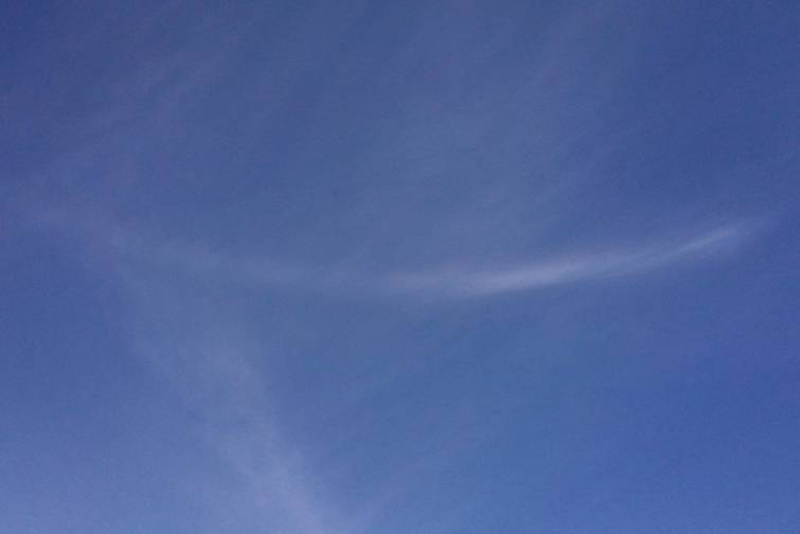 Though 120-degree paranthelia are generally rather inconspicuous and so infrequently observed, there's an outside chance to see them whenever cirrus clouds, composed of ice crystals, sweep across the sky. In fact, this is the third time I've photographed one in the last two and a half years. Paranthelion form when sunlight is reflected in plate-shaped, hexagonal ice crystals that are all oriented like dinner plates -- so the side faces of these crystals are vertical. Because they result from reflection and not refraction, they don't offer the beautiful colors as do some of the other arcs and bows that grace the sky. Nonetheless, it's a delight to see these "solar spots" far removed from the actual Sun. See Related Photos below for more views of the 120-degree parhelion. Photo details: Make: Apple; Model: iPhone 3GS; Focal Length: 3.85mm; F Number: f/2.8; Aperture Value: 2.970; Exposure Time: 1/1151; Shutter Speed Value: 10.168; ISO Speed Ratings: 64; Metering Mode: Average; Exposure Program: Normal; White Balance: Auto; Flash: No flash function; Software: GIMP 2.6.11; photo taken at 11:34 a.m. Heavy Snow in Northeastern U.S.